So you want to make money with Google AdSense ? Nice ! Everyone loves it ! And why they shouldn’t ? Of course, AdSense is the best contextual ad-network for bloggers, webmasters or publisher as I have already discussed it in my “Beginner’s Guide to AdSense Blogging“. But one common problem every new bloggers face is that they don’t get able for getting Google AdSense Approved. Of course, they commit some common blogging mistakes but not being able to get AdSense approval is something what makes them mostly frustrated. If you already know these must know facts before getting started to blogging, you may reject the frustration of rejection and go ahead with passion and dedication. But after getting started to blogging and doing all the hard work, the final thing you don’t want is to get rejected by Google AdSense team. Although AdSense is not the only way to make money blogging and there are already several other ways to monetize your blog traffic but yes, getting Google AdSense approved really matters. That is the reason why many of my new blogger friends keep looking for the “AdSense Approval Tips-Tricks“. But let me tell you one fact, gone are those days when people used to get Google AdSense approval with black-hat tips and tricks. Now, with introduction of two-step new approval process, getting Google AdSense approved has got quite tougher as the Google AdSense team has got smart enough to strictly monitor all your site’s activities and details. And if they find you involved in black-hat, they’ll keep rejecting your site and you’ll never be able to get AdSense ads showing on your site. But if you are still struggling for getting Google AdSense approved account, you need to keep reading this post as today I’m going to share all those genuine white-hat tricks that would make you able to get your AdSense approval easily and quickly. But before I share my quick AdSense approval tips with you, let me share why usually AdSense application is rejected. Why Google AdSense Team Rejects Your AdSense Application ? Over the past one years, I have been connecting with many bloggers – newbie as well as seniors. I have been helping them in the process of getting Google AdSense approved as well as learning from seniors and therefore I’m sharing personal experience why many AdSense application get rejected. This is the most common reason why many AdSense applications are rejected. Usually new bloggers apply for Google AdSense as soon as they launch their website. They are quite tempted to make money with Google AdSense very fast but keep in mind, the AdSense team needs enough [quality] content to show ads on your site. So consider improving the quality of your content and must write long detailed post containing more than 500-600 words. However there is not any such specific number of posts that you must have for getting Google AdSense approved. Another common reason for not getting Google AdSense approved, which not many of bloggers come to know in their initial days of blogging is about copyrighted materials. We all know that images enhance the quality of a blog post and adding images to a post is quite important. But these images are good as long as you hold their copyright otherwise they might produce adverse effects. So use only royalty free images or else do proper attribution of creative commons. Though many people think that having these pages doesn’t hold that importance. But I must say, without these pages your site is incomplete and AdSense ads can’t be placed on incomplete websites or websites under construction. Another very common reason why you are not getting Google AdSense approved is not having good navigation within site. This is often ignored by many bloggers but its equally important to let users navigate easily when they browse your site. Starting from the very beginning, there involves some common steps which you need to follow for getting Google AdSense approved easily. In the past people used to get AdSense approved using a sub-domain like abc.blogspot.com or xyz.wordpress.com, but now its a thing of past. And you need to have a top-level domain name in order to get quick AdSense approval. This is also the reason why blogspot bloggers must buy a custom domain name. So better follow these tips to select a perfect domain name from best domain registrar websites to buy cheap domains. When you are looking to do serious business blogging you need first invest some money in stuffs like premium WordPress themes, custom template, best hosting service etc. to have a top quality website with good attractive design & navigation. Because having quality content alone doesn’t guarantee your blogging success. Usually new bloggers commit a common mistake of copying content from here and there. Doing this may make you “Hero” for some days but seriously doing this will take you nowhere. Also ever changing Google SEO algorithm and AdSense team doesn’t value copied content. So better write fresh and useful creative articles for readers with these creative writing tips. As discussed above in the post, you should not include copyrighted material like copyrighted images, videos, files etc. in your blog post. Also, if you offer any download link to software or files etc. make sure they are not copyrighted or illegal. Same is the case with your content, don’t fill your blog with hacking or cracking tutorials or illegal resources like adult content, gambling/casino/alcohol related contents etc. If your site includes such types of material, they’ll reject you without any consideration. An about page lets visitors know who you are, what you offer and why people should trust you. It is most important page of a site that must exist from very first day. Without about page it becomes very tough to know what services you offer and hence you mightn’t be getting Google AdSense approved. Your primary purpose for blogging should be to attach importance to your readers and provide them all useful information. What if they need to contact you privately for any help ? They must need a contact page to get their message reached to you. I know you value your readers but its you and your readers know it, not the AdSense team. So its better idea to let AdSense team know that. Just include contact us page and they are smart enough to know this. Adding some categories makes the sense to let people know what kind of stuffs they’ll get from your site. It means they can trust on you for those topic related stuffs. So indirectly, you build trust and throw a message that you are going to exist there for long time. After all, AdSense team is partnering with you to have a long term partnership, don’t they ? After launching your site first thing you should do is to get your blog indexed in search engines, as this helps you in getting traffic to new blog from search engines. Though not necessarily yet the more search traffic you have, more green signals you get for getting Google AdSense approved. First of all let me declare that traffic is not necessary for getting Google AdSense Approved. This is the biggest conception which has been spread by some crazy people in the industry. They simply put a logic behind this “Why AdSense advertisers will advertise on your blog if they don’t get traffic ?“. I must say, it is not your business. AdSense team has got perfect skills for managing all these stuffs and they simply need few more websites to fulfill huge demand from advertisers. Yes, it is the most recommended AdSense approval step. Not only AdSense, its same story for all other Ad-Networks. They need some neat and clean websites to review and we all know ads make your site cluttered. So first remove all the ads then apply. This would definitely be beneficial in getting Google AdSense approved account. When you are applying for Google AdSense, keep your legal documents along with you as you must provide all your basic details like name, age, address, country name etc. very genuinely. The AdSense team verify all these details very securely. And once they find these details wrong, the AdSense approval time increases. While on the other hand, if they find all these details true, they approve you partially. The new AdSense approval process involves two steps verification. Firstly they review your site registration details and match with other similar basic details to know whether you are eligible to get into AdSense publishers team, thus they approve you partially. And when the second step completes, you get full green signal and a congratulations message is sent to your email using which you apply for AdSense Approval. Though following above AdSense approval tips will surely help you for getting Google AdSense approved very quickly yet if you didn’t get approval, the best thing is they state the reason for rejection. So correct those error and must re-apply. You have right to re-apply 1000+ number of times as long as they don’t ban your application permanently. So if you stop applying after 1 or 2 times, you are surely wasting your remaining 999+ chances for re-applying. Everyone focuses on tricks to get Google AdSense approval but no one says you the hard truth about Google AdSense. And I must share the hard truth with you here – The AdSense team is very strict in making you follow their program policies. You are in their revenue sharing program as long as you follow their terms & conditions. The violation of policies may lead to permanent banning of your account instantly. So keep following their policies, if you have to stay longer in the game. 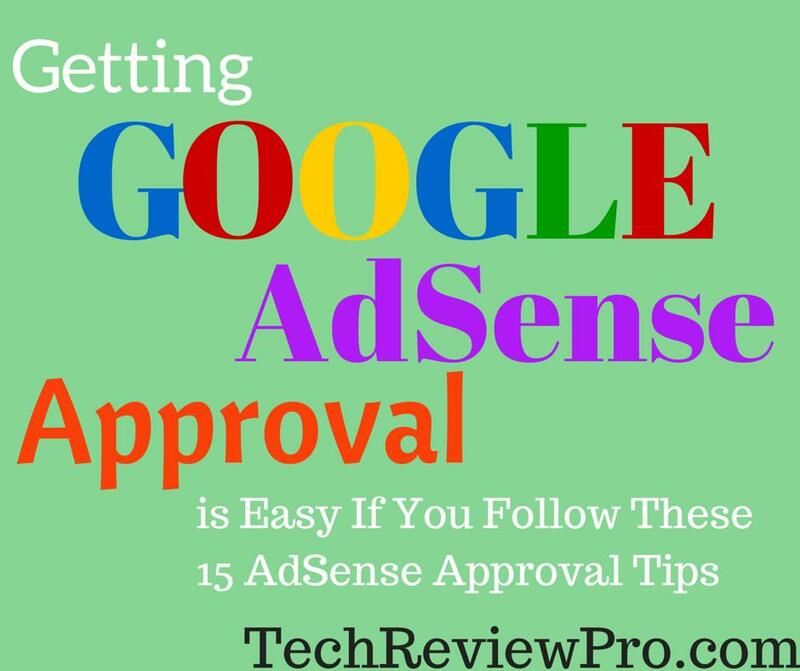 Getting Google AdSense approved is not very tough if you follow above listed AdSense approval tips & tricks. Though many people think that the AdSense approval process has got quite longer and tedious as compared to what it used to be 2 years ago. But I still think it is quite easier to get your Google AdSense account approved and ready for serving ads on your site. However, not getting banned is quite tougher. But I must say, it is more important to not getting banned as compared to getting Google AdSense approved. What do you think? Are you having any problem in getting Google AdSense AdSense approved? Are you facing rejection again and again? What reason for rejection you are getting? Put in the comment box, I’ll love to answer your queries to help you in getting Google AdSense approved. Also, do let me know if I missed any of AdSense approval tips. What are the Best Free No WiFi Games to Play Without WiFi? my blog is rejected 3 time…!! i hope to get approval after follow this guidelines……!! I wish you all the best for quick AdSense approval. I need some assistance with getting my site approved; I’m currently an Amazon affiliate and I haven’t did much research to why I’m getting denied (2 times now). I’m assuming becuase of copyright content but I’m not sure how I should fix this being an affiliate. I’m willing to pay someone to get me approved at this point. The issue of images have gotten so many application disapproved. I wonder if one can apply without having post images even though having unique and original articles. You are right ! There are many applications which have been rejected due to issue of images but Google AdSense team is quite strict against the copyright violations. So better you don’t use such images which hold copyright or use only royalty free images with appropriate creative common licensing. You may also use Google for finding such free images. Take a look at these resources. 1. How to Find Royalty Free Blog Images Using Google Search ? 2. How to Find High Quality Free Blog Images Using Flickr ? Once you remove copyrighted images, re-apply for Google AdSense. I’m sure they’ll approve your application. Hope this would help you. Do let me know, if I can help your further. Please review my blog and provide me suggestions with examples on my blog. I just checked out your site, it is quite cluttered with other ads like infolinks etc. and doesn’t provides good user-experience. Also, the home page is not well organised. You should consider working on your website’s design and navigation. I don’t say that placing other ads like infolinks is bad for AdSense approval but consider removing other ads before applying as it provides clean user-interface when the AdSense team visits your site. Also, consider increasing the length of posts specially for those posts which contain codes or scripts in a large part as the codes and scripts are considered auto-generated content by system. Getting some comments from users will also help, not only in improving user-experience on your site but also in increasing length of your pages. I would like to request if you can go through my site and point out any mistakes. I just went through your site, it seems AdSense team is rejecting your application because of your site already being cluttered with ads. I would recommend you for removing Infolinks ads and re-applying with a neat and clean website. When i did apply for Adsense, i have not registered with infolinks. Only after second rejection, i registered with infolinks and start publishing ads. I am planning to remove all ads from my blog when i think i am ready for applying adsense again. Can you please comment any other thing which need to taken care of before applying.